The Star Casino in Sydney Australia was recently renamed having been formerly know as the Star City Casino, and fortunately they have not altered anything about the casino itself except updating several of the card, table and gaming machines, this ensures whenever you visit you will be getting instant access to a very diverse collection of games. Star Casino Games – The Star Casino has loads of casino card and table games from some of the more exotic ones such as Texas Hold ’em Bonus Poker, Craps and Four Card poker, to the more commonly found and played games such as Baccarat, Blackjack and Roulette. 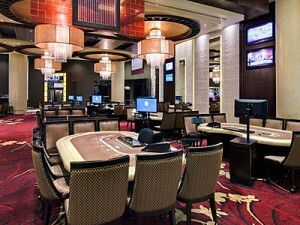 All games come with varied table stakes so you will find a game in play to suit your pocket! Star Casino Slots – The main attraction however of the Star Casino is their massive suite of gaming machines, they have over 1500 slot machines spread over the casino floor, and no matter in which direction you turn you will find row upon row of them, all boasting various stakes, jackpots and playing features. Australians affectionately refer to their slot machines as Pokie Machines or Pokies, and one of the main suppliers of these games is a company called Aristocrat. They have been designing and manufacturing land based gaming machines for years now, and as such you should check out those games you see which hail from this company as they all offer unique playing and paying structures which you may find very hard to resist! Star Casino Address – The Star Casino is located at 80 Pyrmont Street Pyrmont, Sydney, Australia the postal code is NSW 2009. Should you wish to contact them by telephone then their number is (02) 9777 9000. Star Casino House Rules – The casino house rules state that all visitors are dressed appropriately in smart, casual clothing. No person under the age of 18 will be permitted entry to the Casino at any time. Star Casino Opening Times – The Star Casino is open each and every day, and is open 24 hours a day, The only exceptions to these opening times are on Christmas Day, Good Friday and Anzac Day, when opening times may vary. You will find two top class Hotels available to stay at the Star Casino one of the most popular is The Darling, it boasts some 171 rooms, and each room offers stunning views of either the Sydney Harbour Bridge or the Blue Mountains. However you may prefer to opt to stay at the Astral Tower here they offer Deluxe rooms, luxury Suites or the luxurious Penthouses, these Penthouses offer the ultimate facilities and are reasonably priced. Both casual and fine dining facilities and venues are offered at the Star Casino and some of the best known resident chefs provide you with the ultimate dining experience. Look out for Chase Kojima and Luke Nguyen who are both famed for their signature dishes, and are often to be found in their own respective Restaurants here at the Star Casino.